This one was written nearly ten years ago for a proto-blog. I am moving it from my old website which is about to shut down so it can find a home here. 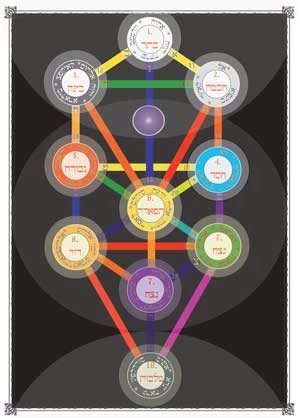 Cabbalah and the Tree of Life can be used to answer many different questions. But one of the mistakes of those who use it is to assume that it is giving you the answer to everything on a single map. Instead what it does is provide you an answer to a question. This answer can be deduced with a basic knowledge of what the ten stations of the tree of life represent along with the paths. If you want the answer to a question, you would think of the question and then apply it to the tree. I have seen this approach used in everything from management charts to understanding some obscure Enochian idea. Over the weekend I was in Nottingham for a Golden Dawn Temple meeting. One of the members was a bit perplexed when I said that the soul did not become separate from the One Thing until Netzach. So if we look at the tree to answer how I reached this conclusion it might show how you get answers to other questions you might have. Firstly the Tree starts from the premise that there is only One Thing and all things are an expression of that One Thing. The first three spheres, Kether, Binah and Chockmah relate to how that One thing acts in its most abstract way. Kether (One Thing) is both Force (Chockmah) and Form (Binah). In otherwords A=B+C with B and C being a subset of A. Kether when it is being force is called Chockmah and Kether when it is being Form is Binah. Instead of being Kether centred these spheres are focused on Tiphareth. Tiphareth is the reflection of Kether (via Daath), there are some differences due to the fact that the One Thing is now part of its creation. When Tiphareth creates it is with the polarities of Geburah and Chesed. However it is clear that this triad is simply the One Thing reflected within creation. It is not divided yet it is still One Thing. However there is another veil here which is the veil of Paroketh. Paroketh was one of the names given to the veil in the temple between the outer world and the Holy of Holies. For the One Thing to step between this veil would bring it into manifestation and to do that the one would have to become the many. It is therefore at this point that the soul splits from the One Thing to become individual expressions. 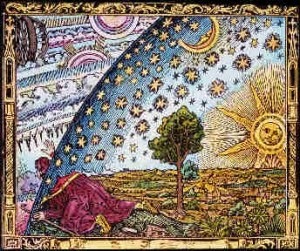 Further the magical image of Netzach (which is the next sphere on the lightning flash) is the Seven Lamps and the order of Angels connected to it are the Gods or Elohim. Looking at the symbolism further. The seven lamps represent the archangels, but are also a division of the White light of the One Thing into the colour of the spectrum of the Many. It is the Gods of Netzach who say in Genesis “let us make man” and make him from the clay of the Earth. So with the one Thing now split into many different forces it is up to the One thing in Tiphareth to create forms for it. However once again nothing is actually created at this point. There is again another reflection of Tiphareth at Yesod which overseas the bringing down into Malkuth of the many different forms as expressed by the four elements. Based on what I have said above, I am saying that the Higher Self, or Adam Kadmon, which is attributed to Tiphareth is a reflection of the One Thing. Everyone then has the same Higher Self and is ultimately connected to the One Thing. However notice that I am not saying that the Ruach of an incarnate person is the same thing as the Higher Self because it too is centred on Tiphareth. The details of the Sphere of Sensation of an incarnate person can be found by asking a different question in mediation on the Tree of Life. So the tree has revealed that the One Thing is the entire three spheres and not just Kether. Because of the way the Tree is structured, there is a veil between the top three spheres and the next three of Chesed, Geburah and Tiphareth. This is the barrier between God inside its creation and God excarnate. I humbly must disagree with you concerning the Adam Kadmon statement. Adam Kadmon encompasses the whole of Otz ha Chaim and it not attributed to any particular Sephiroth. Adam H’Rishon (also called Zeir Anpin) on the other hand can be attributed to Tiphareth and the Higher Self. The Higher Self is the Neschamah and does not have its root in Adam Kadmon. Rather it is the Yechidah that has its root in Adam Kadmon. The Zeir Anpin involves not only Tiphareth but the 5 Sephiroth surrounding it, thus it is a Partzuf albeit an incomplete one. The Splitting I will say occurred in the Yesod (symbol of the covenant) where Zeir Anpin broke away from Nukva (Malchut).